I have been using a flip phone since the 1990's. I only bought it because I traveled on business and needed a way to communicate on the road. There weren't any smartphones then. The little phone fit easily in my purse or pocket and I used my landline whenever I was home. I only gave family members and very close friends my cell number -- and, of course, services that insisted I get two-step verification by text message. I don't really text anyone myself -- yet. Almost everyone I know seems to have a smartphone and many seem addicted to them. But I didn't want one. I hate typing on tiny keyboards with my arthritic fingers. I like to work on a desktop where I have it all. So I happily blogged on and resisted the smartphone. I processed my photos nicely without one and took a digital camera on my photo walks. Then came Instagram and I couldn't join the party. Unless I got a smartphone. So five days ago I finally got one. I wanted to buy the phone with the best camera. My plan was to start making more videos where I could just talk to people, so I needed a front-facing camera. I also wanted to get great nature and product photos and videos for my blogs and for making Zazzle products. And, of course, I wanted to be able to post to my Instagram account with my own phone -- not Hubby's. I was using my PC to like and comment on posts from my friends, and I wanted to join the fun and post more. Now I can. If you like nature, books, gardening, or a simple lifestyle, you can follow me on Instagram and see the quality of what I've posted so far from my new phone. I'm barbradis on Instagram. I decided on the Galaxy Note 9 because it had great cameras. 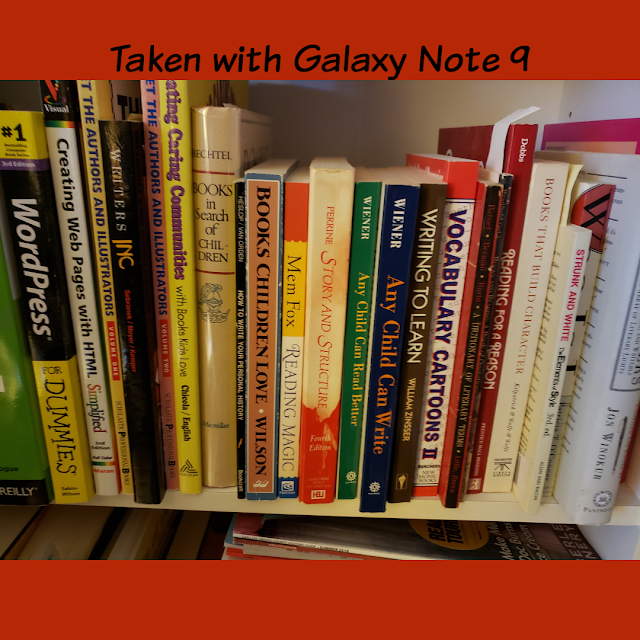 Yes, the iPhone camera is also a good one, but for my purposes, the Galaxy Note 9 tops it. There is also a lesser reason. I have both a Windows PC and an iMac. Both have been sick. While my PC was really sick, I used the Apple almost exclusively, even though it was really slow. I couldn't find anything. I called our local guru to come fix it and he confirmed that Apple just hides things and you have to know the tricks to get around that. I like a clear file path. I think in Windows, not Apple. I understand Google better than Apple. I thought over the long haul I'd be happier with Android. If I had already been a smartphone user just trading up or getting a different brand, I don't think the learning curve would have been as steep for me as it's been these last five days. I'm used to the space and options I have with a desktop. I work with forty tabs open in Chrome, four notepads to cut and paste from, and several Windows Explorer windows open at once. Although the Galaxy Note has a larger screen than many phones, it doesn't come close to the 21 inches my computer monitor has. The Note 9 lets me open several apps at once and flip between them, but I had some trouble getting an email with a pin I needed to put in a registration form for Verizon or Samsung -- I forget which. Once the email came in through the GMail app, I couldn't get back to the form where I was supposed to enter it. I think that would have happened on any smartphone. So most of my learning curve is just learning to use a smartphone instead of a PC -- not something unique to the Galaxy smartphone. It's a totally different way of working. It will take time to really get good at this. 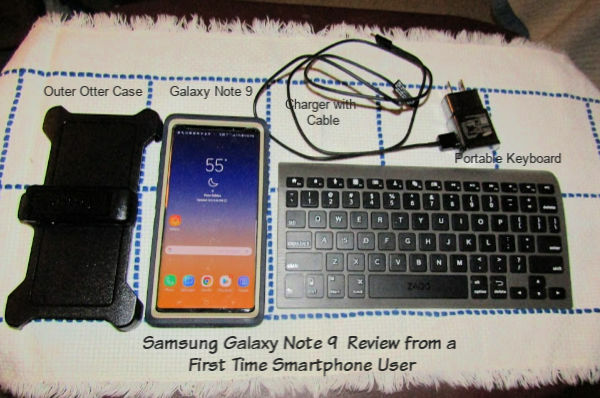 The thing that bothered me most was that tiny keyboard. It's hard for me to hit only one key at once -- even though the Galaxy Note 9's keyboard is larger than most. I have two work-arounds for that. First, I use that little microphone on the keyboard and talk instead of type when I can. 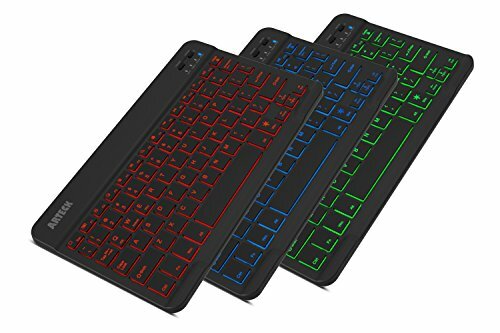 I also have a small wireless keyboard I bought to use with another device. It plays nicely with my Galaxy Note 9, as would just about any portable Bluetooth keyboard. So if I'm free to talk without disturbing anyone, I make my Instagram captions and hashtags with my voice and correct most of my mistakes using the keyboard. The speech recognition does confuse to with too or two. I have to speak slowly. It mistook my friend Celia's name for silly. But I can live with that as it learns to better understand my voice. The way the phone camera handles lighting differences -- what's in the shade shows better than it does in my Canon PowerShot photos if the photo subject is partially shaded. When I shoot videos while walking, they are less shaky than the ones I shoot with my Canon PowerShot SX410 IS. I'll show you one of my photo walks below. The ability to take multiple photos in quick succession by holding down the volume button. I learned this accidentally. Clear voice reception on calls. I called my landline and my husband just to make sure. Easy contact management, but I confess that I used my little bluetooth keyboard to help enter the names and numbers. Fast charging and long battery life. Flaps that cover the ports for the charger and headphones to help keep them safe from water and dust during everyday use. The S-Pen with its many amazing features, only some of which I've tried so far. I can't do it all in five days. So far I've found it very handy when I have to use the keyboard since I can better control what I click. A video I watched showed many more pen features I have yet to try. 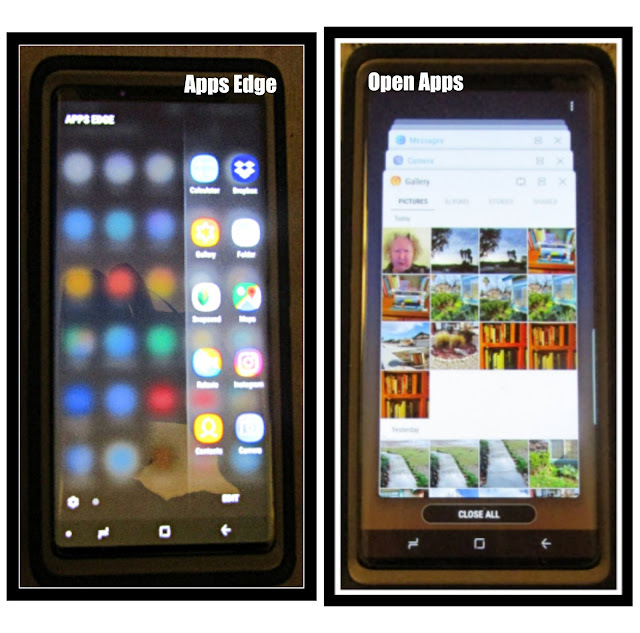 The S-Pen can even control some phone features remotely. I can use the Do Not Disturb setting to keep away all notification sounds during the hours I sleep. While I'm trying to fall asleep I can play relaxing music for as long as I set the timer for -- all while my phone is charging. I made this video with the Galaxy Note 9 in the morning during a lull between rainstorms. This is my phone color. 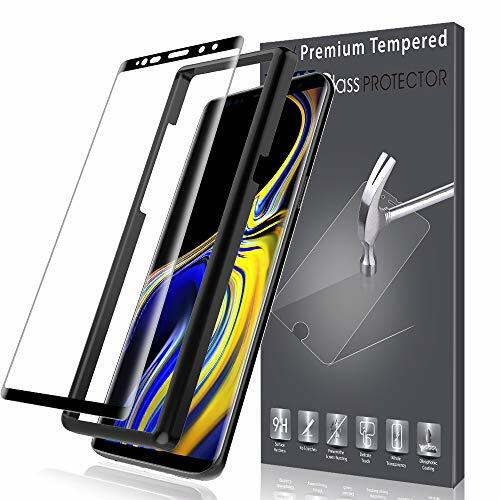 I also bought the case and screen protector to keep my investment safe. I already had a portable keyboard to use. Much as I love my new phone, there are some things I don't love as much. The phone is somewhat heavy because of its size. The shape of the phone, though similar in shape to most other smartphones, is harder for my arthritic hands to hold while trying to take a photo than a camera is. 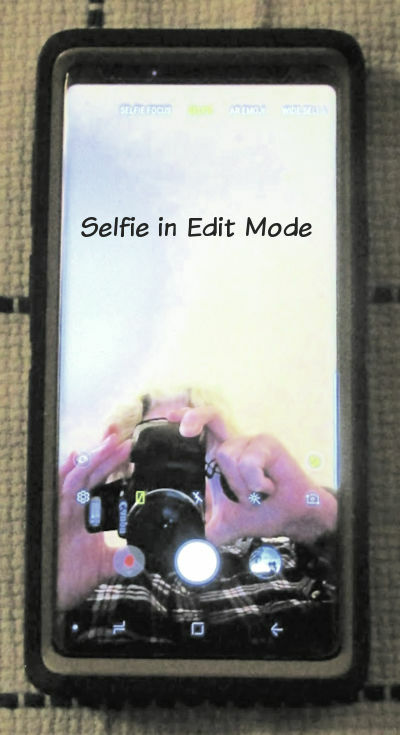 If I want to take a horizontal photo, it's really easy to press the button that will make the phone take multiple shots in a row as long as the button is held down. I'm learning to be careful how I hold the phone. I have never yet found a camera that made selfies I liked. I'm afraid the problem is not the camera but the subject. Nevertheless, I made a selfie so I could photograph the screen for you. The weird colors are the result of the artificial lighting in the room that my Canon couldn't handle well. Flashes leave light bursts I didn't want. You do see the editing icons here. I don't normally edit photos except to crop them or add text, but I think I'll learn to use some of those available apps that remove wrinkles, etc. Since I haven't learned to use those apps yet, I'm hiding behind the camera. The editing icons are above the circle-shaped camera icons. The bottom row of icons are for the whole phone. The quality of this photo has nothing to do with the smartphone camera, since I didn't know how to use the Note 9 to take a photo of itself. It probably would have done a better job with the lighting. I think I did use one filter and kept it because it changed my hair from gray to the blond I was born with. Once I got my Note 9 smartphone, I started adding more apps. It's almost impossible not to when you see all that's available to play with. The thing that's hard is organizing those apps so you can find them again. The Note 9 gives me the Apps Edge. Most of the time it sits almost invisibly on the right edge of my screen, but I can slide it out whenever I need it. I can choose ten apps to put there, so I included what I use most. I guess they are also put in files. If I click the files icon (far left under open apps screen below) it will show me every app that's currently open and I can go back to working in it. Handy! I love both these features. Perhaps other smartphones also have them, but I only have experience on this phone. So far my favorite free app besides Instagram is Relaxio. It gives me a choice of sixteen kinds of white noise I can listen to alone or combine with other sounds. I can choose from city traffic noises, falling rain, ocean waves, birds, crackling fire, wind, a flowing brook, night nature sounds, coffee shop, and a few other white noise sounds I haven't figured out. I love this app for falling asleep, since I can set a timer for how long it will play. I let it play beside my bed while the phone charges at night. This morning I decided to photograph some books in a bookcase in my office. The only light source was across the room and partially blocked with my iMac monitor. 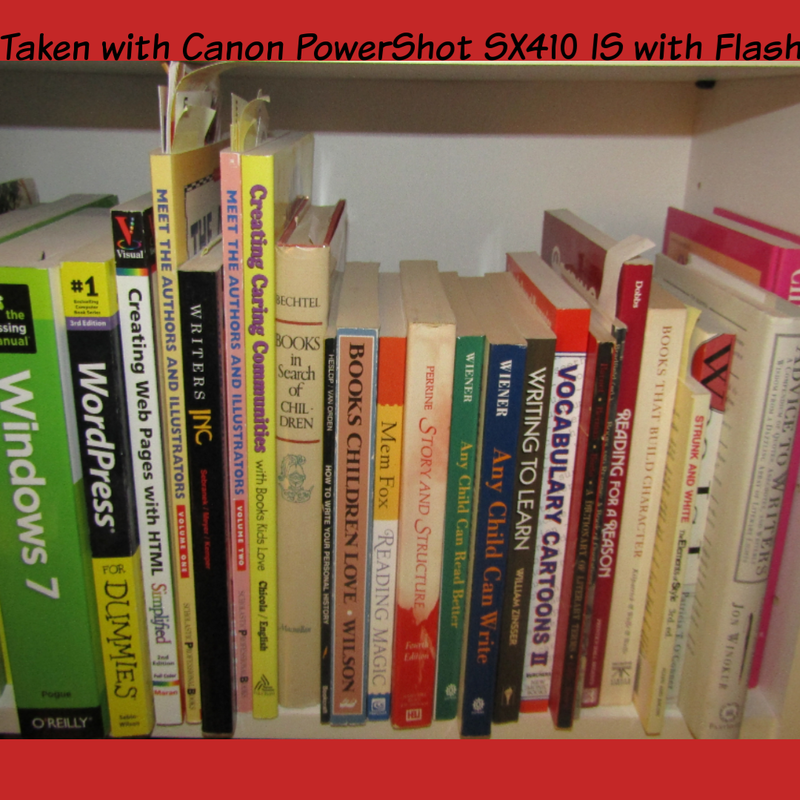 I made the shots as identical as I could except I used a flash for the shot from my Canon PowerShot SX410 IS. The phone, of course, needed no flash. I didn't guess accurately the number of books included in each shot, but I think it's close enough for you to get the idea. Except to crop and size these for Instagram and add a background color in PicMonkey, I did no photo editing to change tone, lighting or anything else. I added no effects. Here are the shots, as I will post them to Instagram later. As you can see, I didn't edit as much extraneous stuff out of the phone shot as I did the Canon shot. I'd never tried putting backgrounds on before in PicMonkey and I wound up using FotoJet to crop the photos when I hadn't gotten the images the right size for the background. I've never used layers before and PicMonkey just added them to their app. In the end I put the wrong photo in the shot above, not the one that trimmed the lower shelf out. I think you still have a fair comparison between the Canon and the Note 9 cameras. If you need a phone with an outstanding camera, I can't think of a better one than the Samsung Galaxy Note 9. I bought it for the camera, but also love the pen and the ability to use it to turn my phone into something very much like a PC should I ever need to. Just tonight I downloaded the Amazon Music app and discovered I also get great sound quality for the songs I love when I play them on the Note 9. Now if my Note 9 could only take a selfie! There's probably an app for that, but I still need to find it. My advice? 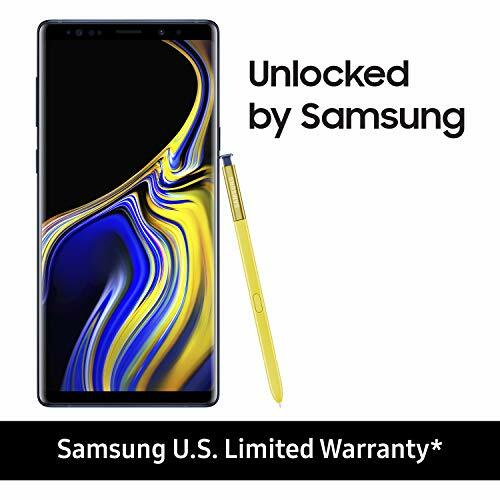 Get yourself or someone you love a Galaxy Note 9. Don't miss our other contributor's reviews of electronic products on this site. I had not realized you couldn't use Instagram without a Smartphone. Of course, I've never tried Instagram or I would have noted that quickly since I don't have a smartphone myself. I also had no idea the Smartphones were so expensive. This is an extremely interesting review. I am still using a Samsung flip phone, which speaks well of the Samsung phones. After reading your review, I would probably opt for the Samsung Galaxy too, but it will take some time for me to wrap my mind around the cost. Yikes! And, like you, it would be a huge learning curve for me. I justified the cost because for me it's upgrading to a better portable camera. A great camera is an essential tool for me, and I don't know enough about the mechanics of photography to justify buying a really expensive camera I wouldn't know how to use and wouldn't have time to spend on the learning curve. I want to be able to shoot and go. Most of the expensive cameras with tons of lenses and accessories are heavy and not very portable. When I really need a zoom for macros, I still have my Canon and because of its shoulder case it's easy to take on walks. I just doesn't handle light differences as well as the Note 9.I take at least 80% of my nature photos at dusk or in low light conditions, and I love the way the NOte 9 handles those. Now that I have the phone, I love using it for music and white noise, and I may even refresh my long forgotten German and start learning some Spanish so I can understand what I hear when I'm out shopping. I went from a flip phone cell phone used mainly for traveling to a Smartphone only 3 years ago. At the time I chose the Samsung Galaxy Grand Prime as the cost (less than $100.00) was within my budget. Lately I have discovered that it has limited space (8g) and I've used up nearly all of it. The newer phones today all begin at 16g, so 'soon' I will need to upgrade. 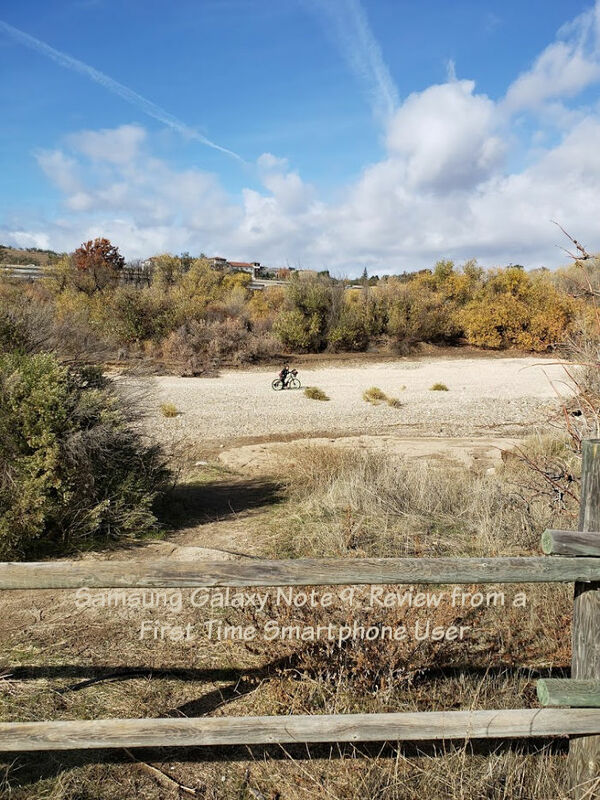 Your review of the Samsung Galaxy Note 9 is well timed, as I am investigating new Smart phones. I have been very pleased with Samsung and will stay with it, but will most likely not get one this expensive. I just need room for more apps. Although, I WOULD love that fabulous camera feature you have. Very helpful review, Barbara. Thanks, Elf. My husband's Galaxy S7 also takes good pictures.But I decided that if I get a phone it will probably have to last as long as I do, so I wanted to get the best one I could. I get to pay it off over two years with no interest, so it's not as bad as it could be. Since I'm not smart enough to get up and running by myself, I bought directly from my local service provider and he set it up. But I think he also cheated me -- or at least lied to me. As he mentioned each accessory I wanted -- case, screen protector, car charger -- he wouldn't give me straight answers about their prices. He just assured me they were included in the bundle and let me believe it was all included in the price of the phone. I thought the phone came bundled, and things moved so fast I didn't see the print out of the contract and bill of sale until I was home. My bad, so I guess I deserved paying that extra money. I knew I'd being paying sales tax, so that wasn't a surprise -- just a shock. But other than that, I did get good service. I'd brought my mini keyboard along and he charged it for me during the time we spent together and then paired it with my new phone. When I had mastered a few basics at home, I finished setting up the phone the way I wanted it to behave. What a wonderful review of the Samsung Galaxy Note 9! Before you know it, you will be so adept at using your new smartphone that you will wonder why you waited so long to get one. It is truly remarkable what they can do compared to the older flip phones. Congratulations on your purchase and thank you for a wonderful review! Had I realized how useful it would be, I probably would have gotten one sooner. I try to learn something new every day.Today's project has been trying to figure out how to get at my Dropbox photos and use them in Instagram. I think I've almost got it, but I'm so tired I think I need to go to bed . Well Barbara, if I ever need a new phone I think I know which one I will go with. This seems to be a phone that does just about everything that I could possibly want to do. Right now I have an Iphone, but I find it is very small in my hands and difficult to use as anything other than a phone or camera. Thanks for this wonderfully detailed review. I love using this to relax and fall asleep each night. The sounds on Relaxio are actually more relaxing than the CDs I have and it doesn't shut off too early like they often do. My biggest problem is the learning curve on getting my photos in the apps I want them in and accessing them from Instagram if I didn't take them from Instagram. I suppose that's something any new smartphone user has to learn. Barb... what a great review. And full of the information and examples that are important to me. I have an android but have often thought I need a phone that is better with photos and videos. I loved taking the walk with you in the park. Fun. I'm hoping to take a walk at my favorite winery this afternoon and make a video of the new mural there. I used my friend's phone to get a few photos when I took her there on her last visit, but that's not the same as spending as long as you want taking all the photos and videos you want. She was on crutches with a broken or sprained ankle that day, so we couldn't spend a lot of time walking around. Feel free to ask any questions I haven't answered. I'm learning more every day. Barbara, this is an excellent review. You've learned a ton about this phone. I've had my iPhone for years and I can safely say I couldn't write as thorough a review as you did on your phone! I don't think I even know as much about my phone as you do yours! I sure can't be without it, the convenience is unmatched. You've sold me on this model as well. Until I wanted to participate in the Instagram party, I didn't think I'd need a smartphone. Now I can hardly tear myself away from it. I spend about an hour a day reviewing the German I haven't used in 50 years, whatever time is needed to lull myself to sleep with Relaxio, editing photos and posting on Instagram, and exploring new apps. But I'll admit that though I'm enjoying myself more, I'm getting less productive work done because of the distraction. At least I can count taking photos for my blogs as work. I don't want to be addicted to my phone. This is probably one of the best phone reviews I've seen Barb. 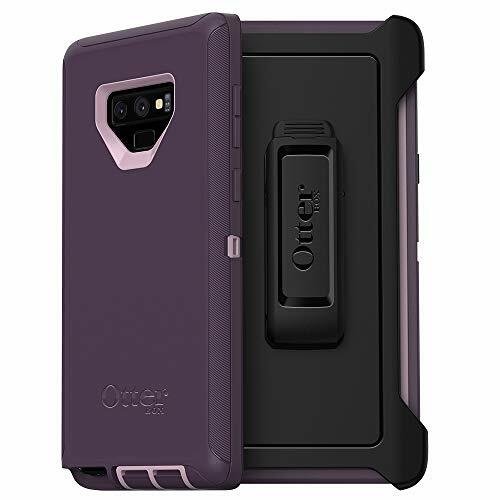 I was a Samsung girl until 18 months ago when I had to upgrade my phone and I decided on an Oppo - the camera (at that time, it's different now) was a better one and the price tag a little friendlier. I wouldn't hesitate to go back to a Samsung Galaxy again though. Looking forward to seeing your posts on Instagram, it's a fun platform. Louanne, I've been watching your posts and videos. It's been fun hearing your voice. I don't understand stories or how to post them. Have you ever written a post anywhere that explains that?